The color appearance of digital video imagery acquired from analog sources is affected by intrinsic device imperfections. Although the human visual system (HVS) is capable of perceiving color variations when comparing different acquisitions of the same video, it is able to identify the colors in an isolated image as well. 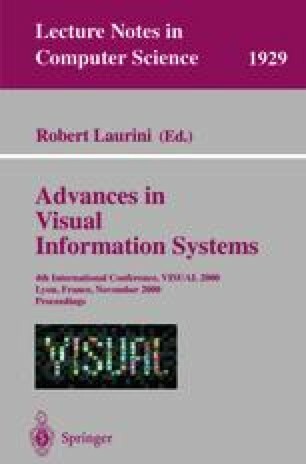 Color based computer vision processes applied within digital video libraries do not have this capability and their performance is severely reduced. This paper presents a method for modeling the intrinsic color appearance given by acquisition devices. It is based on the approximation of the distribution of colors generated by a device using a mixture of Gaussians in RGB space. Its parameters are encoded in a speciffically designed pattern, which provides a dense estimation of the distribution of colors along the whole RGB space. In this way, the model can be attached to every acquired video in order to put its original color appearance on record. The approximation by mixtures of Gaussians lets us define transformations between them that preserve the identity of colors. This fact is shown in the case of skin color segmentation, where the underlying concept of color is captured from samples obtained by a particular device. Other applications of color correction in digital video are pointed out in this paper as well. This work was supported by CICYT grants TAP98-0631 and TEL99-1206-C02-02.